SID GRAUMAN PROLOGUE, "Glories of the Scriptures"
Premiere Seats $11.00 each. Fred Niblo introduced David Wark Griffith, Master of Cerimonies, who presented the Hon. 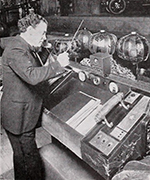 Will Hays; and Miss Mary Pickford, who had the honor of pressing the jade button that began the premiere performance. 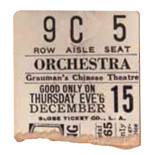 Telephone number at Grauman's ChineseTheatre Pagoda Box Office: GLadstone 5184. 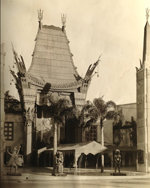 Reported Gross "King of Kings"
Miss Mary Pickford in Mr. Grauman's promotional areoplane. SID GRAUMAN PROLOGUE, "Argentine Nights"
2. La Jota Dance-Triana and Antoinette, and Ensemble. 3. Senorita Cordova, Castanet Dancer. 4. Acrobatic Fantasy, Leonard St. Leo. 5. Gaucho Chorus, "White Men's Gold." 8. Mariano Del Gado, Musical Gourd Player. 9. Samuel Pedraza, South American Tenor. 10. Harry White and Alice Manning, Comedy Dancers. 11. Borrah Minnevitch and Argentine Rascals. There will be an intermission of eight minutes after the first part of the prologue. The Chinese gong in the forecourt will be sounded to announce the beginning of the second part. Please remain seated after the running of the picture, as the cast will be personally introduced. 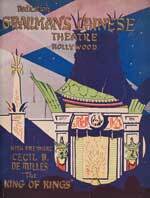 Film House Reviews - Grauman's Chinese, (Hollywood) - Hollywood, Nov 4. Sid Grauman pulled the second opening in the career of this house and it was a pip. They were all there in their smartest gowns and jewelry galone (sic). And $5 to sit in. Few Annie Oakleys in the house and the intake ran better than $9,000 on the night. Sid gave them the greatest and most expensive stage presentation in the history of his operation in Hollywood. 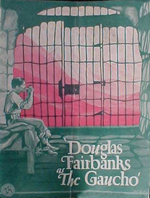 The show will help Doug Fairbanks' 'The Gaucho' cash in for at least three months. Grauman calls this one 'Agentine Nights.' The set is an Argentine village in the shadow of the Andes. It's similar to those erected in the studios and as substantial. Plus the lighting, it's extremely effective. Grauman spent dough and it shows. Some 100 people on the rostrum, with not a dull moment during the 55 consumed. 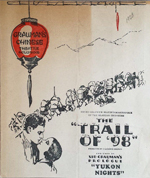 It was the smoothest opening performance Grauman has ever had, its length meaning encores. The cheif clickers in the order that they scored were Borrah Minnevitch and his harmonica boys, Harry White and Alice Manning, and after that the Gaucho Marimba band, picked up by Grauman in San Diego. When Sid gets the show running regularly this same mob can do their stuff in less than 45 minutes. Opening had the entire ensemble on stage with a Padre informing it was a festive day. They started in by chanting after which Triana and Antoinette, mixed team, did an Argentine routine aided by a mixed octette. This was fast stepping and pleasing. A chorus of 16 men then did 'White Men's Gold,' which was the gap before a quartette of Indians came on and did the Andes rain dance. Whether this dance was Andes or American only Sid knows, but for the cash buyers went for it. Then came the seven marimba pounders, who after specializing accompanied Samuel Pedraza, South American tenor, for a couple of numbers. The band then served as a background for Mariano Del Gado who extracted weird tunes from a gourd, a musical instrument shaped something like a cucumber. It was a new one for the crowd with Del Gado, if that is his right name, somewhat of a comic. White and Manning speeded it up some more. This duo, brought on especially from the east, are new locally and found the mob a pushover. Looks as though when they finish here it will be a pipe for them if they like California. The picture houses and productions will surely want them. Next to shut came Borrah Minnevitch and his 13 boys. The gang rushed on pell mell in grotesque costumes and went right into their stuff. It was a panic and turned out to be a case of how long Minnevitch wanted to stay on. With the entertainment having attained a high point, the padre announced the day of festivity was over and it was time for prayer. There was chanting from offstage with the players entering the church as the drapes were drawn. Grauman clicked with this one and it warrants the Fairbanks picture being sold at $1.50 top. Arthur Kay conducted the orchestra, providing as the prelude a catchy overture entitled 'Argentine.' It was a medley of South American and Spanish numbers that blended. The pit crew of 45 or so have an easy time during the prolog as most of the music is supplied by the stage specialties. There will be an intermission of eight minutes after the prologue. The Chinese gong in the forecourt will be sounded to announce the beginning of the picture. 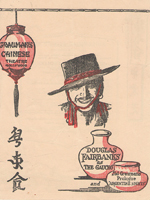 These undated programs were presented to patrons during the run of The Gaucho, The acts listed in the prologue differs from the opening night program. "Presenting, for the first time on any stage, in a magnificent setting, the new Ford Sedan, Standard Coupe & Sport Roadster, these new and exclusive models have just been received from Detroit. Special lighting effects and musical score. Entire presentation conceived by Sid Grauman. Performances at 2 and 8. Preceded by a special feature film "The New Ford Car" - showing the manufacture and assembly of the new car at the factory." Conductor Arthur Kay in a publicity shot taken after "The New Ford Car" opens; the wheels of the car are just visible in the upper right. SID GRAUMAN PROLOGUE - "Ballyhoo"
Premiere Seats $5.50 each. Fred Niblo, Master of Ceremonies. Film House Reviews - Grauman's Chinese, (Los Angeles) - Los Angeles, Jan 27. Sid Grauman has put this particular stage attration on because of 'The Circus.' with Charlie Chaplin, running but 70 minutes. So he spent a bit of dough to put on an atmospheric entertainment in the interior of an old-fashioned one-ring circus. On the outside of his theatre are the menagerie cages, freaks, etc. They were right in the foyer and welcoming the incoming guests on opening night. Then, too, Sid gave a lot of pink lemonade and hot dogs at the intermission in the frecourt of the theatre. That's all for $1.65 top. Sid has an orchestra of around 50 in the pit. Will Prior is conductor. Prior had one of those old-time overtures, with songs of the days when you were a boy, which served as a prelude to the opening scene. 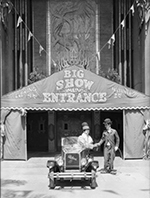 That scene was the outside of the side show with the boys doing the ballyhoo, just as they do on the big lot. Sid trotted out all of his sideshow freaks, from the contortionist to the tall guy and the fat girl and the midget. He did not miss a detail. That scene was not long either, about eight minutes. The drapes were then flown, and one saw the interior of a circus tent. The big top was up and the patrons were in the bleachers. Those patrons were wax figures, too. There is many a near-sighted booker in vaude who would have thought they were alive. First to take the big announcement from the guy with the walrus mustache were Samarnoff and Sonia, with their acrobatic dogs. Great to get a show under wal (way) as the turn is fast and a flash. Pepito, musical clown, next with a short specialty, and then worked during the interludes. While they were waiting between the first and second scenes there was a pretty good male singer, who gave them 'Pagliacci' in clown costume. Just atmospheric. After Pepito the Rooneys—Ed and Jenny—in aerial trapeze work. They supplied plenty of thrills with their stunts. Then Jenny came back alone and gave the cash buyers a few more thrills on her own. Three Freehands, boys, did their gymnastic and perch work, which went over smashingly. Slayman Ali and his Blue Devils, eight, trotted out for their whirlwind stuff. Then Pallenberg's Bears, which always clicks. After that was the piece de resistance—Poodles Hanneford and his family. Out-and out show toppers as well as house fillers. Not a bad show all around, and none too expensive. 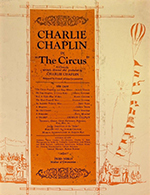 These undated programs were presented to partons during the run of The Circus; the acts listed in the prologue differ from those mentioned in the Variety House Review. Pepeto the Clown with a Chaplin imitator from the "Ballyhoo" prologue. SID GRAUMAN PROLOGUE, "Northern Lights"
Scene - Pioneer Dance Hall, Dawson City. Chief Caupolican - famous Indian baritone from the Metropolitan Opera, New York. 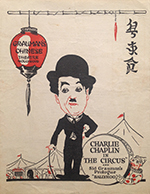 Film House Reviews - Grauman's Chinese, (Los Angeles) - Los Angeles, May 9. 'Northern Lights' Sid Grauman's prolog for 'Trail of '98' (M-G) is am atmospheric entertainment affording wholesome amusement to those who fork over the $1.50 to enter these portals. Presentation was of the period with tunes thought tucked away in the memory of past generations brought to light again. Set is the interior of a Dawson City dancehall and barroom. 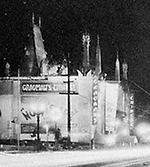 Grauman roamed Hollywood digging up the old boys who have "lace curtains" below the neck line. A Bar, gaming tables and short skirted damsels to look at too. Impressive to see some 60 so-called old timers on the rostrum. Will Prior, house musical conductor, led the overture, a medley of numbers of the period. Then C Sharpe Minor, at the organ, had a good theme song in 'The Tale of '98.' Opening had the mob in one of those old time dreamy waltzes. Upon conclusion the barker, or stage m. c., proceeded to introduce the talent staring off with the LeRoy Sisters, buck and wing. Then Jimmy Ray, a little hoofer who tore off one of those jazz eccentrics that tied the house into a knot. Queen and Harrison, old timers in a clog contest, pleased with Arnold Bob Blackner, cowboy tenor, singing an opratic number that passed in great shape. The Carsons brought back the Texas Tommy to score, followed by Edna Covey and her hoke toe work. Then Chaz Chase. They hadn't seen this comic out here so it was a push over. As the main stage feature Chief Caupolican, Indian baritone, did four numbers. He closed doing "Auld Lang Syne." This permitted the entire ensemble to join in for the finale which took place as the set, on rollers, split in the middle and was taken off as the voices died out and the picture began to flicker. Split of stage set to allow M-G's Fantom Screen to move down and back for the specticle sequences in "Trail." Latest Grauman prolog will be a help to this film epic of Alsaka. SID GRAUMAN PROLOGUE, "Yukon Nights"
There will be an interval of eight minutes after the first part of the programme. The Chinese gong in the forecourt will be sounded to announce the beginning of the second part. Fire Notice: Look around you now, choose the nearest exit to your seat and in case of disturbance of any kind, to avoid the dangers of panic, WALK (do not run) to that exit. If you live out of town patronize your local branch box office of Grauman's Chinese. 50 branches in Southern California. No brokerage charge for this service. 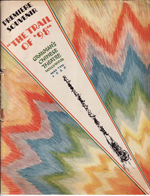 Los Angeles Coliseum, Saturday, June 16 at 2 P.M.
Reported Gross "The Trail of '98"
This undated program was presented to partons during the run of The Trail of '98; the acts listed in the prologue differ from those mentioned in the Variety House Review. SID GRAUMAN PROLOGUE, "The Tropics"
1. Overture—"White Shadows in the South Seas"
a. Prince Lei Lani and the Samoan Chieftains. Most famous of all South Sea dancers, brought to Hollywood by Sid Grauman especially for "The Tropics" prologue, with Leilehua (Aggie) Auld in dances of her native Marquesaa. b. Sol Ho'opi'i and his native comrades. c. The Three Brox Sisters. Internationally famous favorites. We urge all our patrons to remain seated at the conclusion of "White Shadows in the South Seas" to enjoy the introductions of the stars, who will tell you of their experiences during the making of the picture. Premiere advertised director James Cruze filming with director Fred Niblo introducing celebrities over microphone. 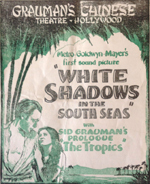 Reported Gross "White Shadows in the South Seas"
Sid Grauman has gotten away from the lavish atmospheric prologs he has been in the habit of staging with his pictures. Reason: Grauman has the house wired; musicians cost lots of money in the pit and are not necessary where a picture has synchronization, as with 'Noah’s Ark.' So Sid just put on an eight minute prelude and used the organ and a piano for musical accompaniment. It opened in 'two' with and ensemble of 36 voices, equally divided, standing outside the portals of the Ark, singing 'Hear My Prayer,' by Mendelsohn-Bartholdy, with Stewart Brady, 14-year-old tenor as soloist. The Brady Boy has one of those clear semi-soprano voices, the main ingredients of which are pathos. Sure fire, with any audience. Then the mixed chorus goes into 'Unfold, Ye Portals,' from 'Redemption' by Gounod, with effects showing the torrential waves and deluge spraying over the bodies of the chanters. Great singing ensemble with voices that can be heard and are distinct in rendition. Third scene is a tabueaux (sic) revealed through transparency showing the interior of 'Noah’s Ark,' with the passengers it had on the eventful journey, including the beasts, fowl, etc, that went with the party. Corking good punch flash with the curtain brought together as the transparency blackens and the artificial waves wash over the songsters. Short, punchy and impressive for stage presentation. Did not cost much and with the music eliminated no doubt Grauman is saving close to $4,500 a week, with, in this instance, house not suffering on the economy as the picture is the draw. For opener they had current Fox news and Vitaphone short with Albert Spaulding doing two numbers on the violin.